I just received an email with an interesting offer from Opodo. 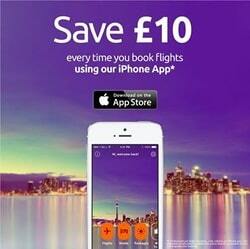 Everytime you book a flight with them via their iPhone app you save £10 per booking. On the grand scheme of things this might not seem very attractive, but if you can find a cheap low-cost airline flight with Ryanair or EasyJet for £20, then you have a bargain. This is a nice way of saving some cash especially as it is per booking, so you can book each flight separately and receive £10off each one of them. All flights must be made through the iPhone app, if you don’t have one, then ask a friend or a family member it works even through your iPad.